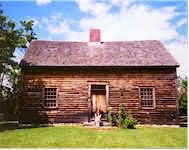 Tomorrow at 4:00 PM I'll be speaking at the Ethan Allen Homestead in Burlington, Vermont. That's why I've been tweeting Ethan Allen articles lately. This will not be my first visit to the Homestead. You can see me sitting in front of the reproduction of the home Allen shared with his trophy wife, Fanny. That was taken back in the '90s while I was working on The Hero of Ticonderoga. That book, and my spin on why Ethan Allen was such a wild man, will be the focus of my presentation. If my traveling companion is able to get a decent (by which I mean a flattering) picture on my cell phone, I'll post it at Facebook. I may also try to tweet it. We're taking a long weekend in the Green Mountains, so I don't expect to be back at Original Content until Wednesday. I hope to be biking Monday and hitting relatives along Rte. 7 on our way south on Tuesday.